Since April is National Pet First Aid Awareness Month, we thought this would be an ideal time to consider how you can prepare for pet emergencies in your home. While cats are nimble and usually seem to avoid getting hurt while making mischief, accidents do happen. 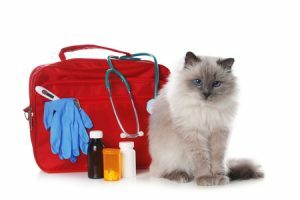 Being ready for the occasional pet emergency means having a first-aid kit ready when the times comes. Here’s what a well-stocked kit for your four-legged friend should include. Some of these items are the same ones that you might already have for your own first-aid needs, so no need to stock them twice. Hydrogen peroxide – Great for cleaning wounds, scrapes, or cuts. Styptic pencil – If your cat has a wound that is bleeding, this will help stop it quickly. Antibiotic wipes or ointment – If your cat has a wound that risks infection, you can apply this before heading to your veterinarian or the animal hospital. Plastic syringe or eyedropper – These tools make applying peroxide or giving water to a sick kitty easier. They also are great for other general-purpose needs. Cotton squares or swabs – These make applying ointments and cleaning wounds easier, as well as removing excess blood. Gauze pads and rolls – Sterile dressings are crucial for helping wounds heal. Place a gauze pad on the wound, then thoroughly wrap the entire area in rolled gauze to prevent your cat from licking or chewing on the wound. Fix the ends with medical tape to secure. Blanket or towel – Swaddle your cat during treatment, during transport to the vet, to warm or dry them, or to contain any bleeding while you tend to their needs. Scissors – Perfect for cutting gauze and tape or trimming away any fur that may be in the way. Be sure to use blunt-edged scissors to protect your pet. Tweezers – Necessary for removing splinters, debris, ticks, or other objects from your feline. Opt for flat-ended utensils. Flashlight – Having enough light makes it a lot easier to see the problem and help your kitty feel better fast. Ice pack – A small ice pack that can be secured with an ace bandage to reduce inflammation and swelling. Saline eye wash – Keep saline drops or solution handy in case your scratches her eye or gets an eye infection. Your vet’s number – Having emergency contact numbers close at hand is always a good idea. Being prepared makes handling life’s little emergencies much easier, so start putting together your cat’s first-aid kit today!